Welcome to our Active Schools page! 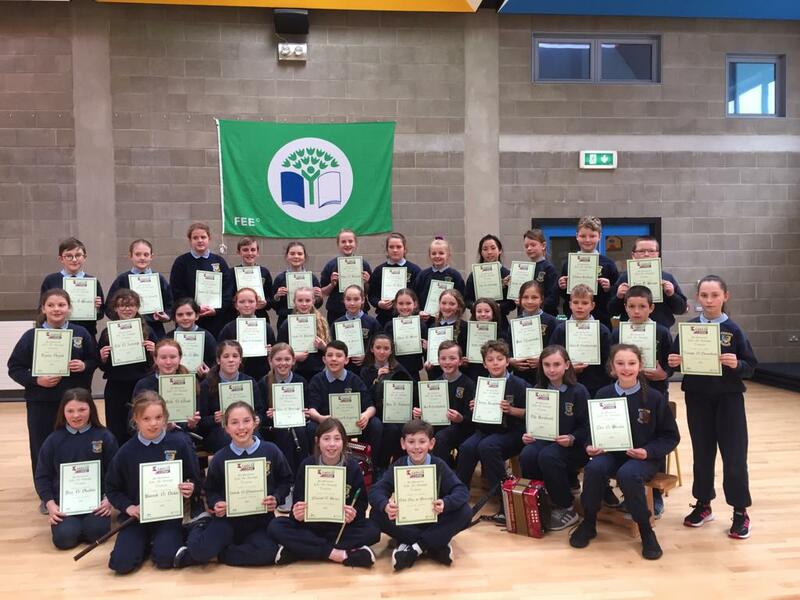 The journey towards gaining Carrig school’s first Active Flag began in September 2017. We, as a school, decided it would be a fantastic initiative to promote physical activity amongst our pupils and staff. An Active School committee, which includes pupils from different class levels and staff members Mr. Prout and Ms. Bergin, was formed to overlook the efforts to gain our first flag. The Active School committee created a bright noticeboard in the halla which gives important information about the effectiveness of physical activity for children, as well as including different activities the class levels complete. The committee, which has pupils from 1st – 6th classes, meets monthly to discuss how different initiatives are going and new ideas suggested by pupils and staff. Every class engages in physical activity daily in Carrig NS. Some of our approaches we decided on to promote exercise amongst our pupils (many of which were suggestions which came from our Active School committee) include Disco Thursdays, Drop Everything and Run, Walk and Talk at Breaktimes and 10 at 10 Operation Transformation exercises. Below are some of the initiatives our school completes to get our pupils moving! PE: All classes have at least one hour of Physical Education timetabled every week as recommended by the 1999 curriculum. Outside Agencies: We are very fortunate to have some outside agencies come to teach us specific skills as part of our PE programme. Patsy O’ Farrell focuses on GAA skills and basketball (depending on the term), Claire Nealon teaches Irish dancing to Juniors, Seniors, 1st and 2nd class and Paddy comes during November and December to teach tag rugby to 3rd, 4th, 5th and 6th classes. Disco Thursdays: We set up a suggestion list on our Active schools display where children could write ideas for pop songs which would be enjoyed by all class levels. Our committee created a playlist and at lunch times on Thursdays (weather permitting), these fun songs are blared across the yard. A full on disco ensues as you can see from the pictures below! Older members of the committee and from senior classes have been kind to try to engage younger pupils to get involved and get moving. Thursdays prove to be a favourite day enjoyed by many children! Drop Everything and Run: After hearing about the success of ‘The Daily Mile’ at an Active Schools meeting attended by two staff members, we decided to adopt this idea into our daily routine. We decided that instead of focusing on the distance covered by the children, we would allow children to run at a comfortable pace for 3 minutes and gradually increase this time as the children’s fitness and abilities improved. This initiative has proved to be extremely successful – class teachers have reported children to be more engaged in lessons following the run and we have seen a great increase in the pupil’s fitness levels. Children count their laps as they run, and after a few months they’ve had a huge sense of achievement and pride as they realise they have increased the number of laps run daily! Walk and Talk – Our Parent’s Council kindly gathered funds to create our amazing walking track which goes around our basketball courts. Children are engaged in soccer, basketball, hurling/camogie activities at lunch times, as well as playground games, but in order to further physical activity for children who prefer to take a break from such activities we decided to create a Walk and Talk track. This allows pupils to chat with friends while constantly on the move. It is a safe zone where we ask other pupils playing playground rules to respect. Operation Transformation 10 at 10 : 6th class pupils were the genius and guides behind this activity in early 2018. This was a hugely enjoyable and successful initiative; the whole school (pupils and teachers!) filled the yard and astroturf and engaged in an intense yet fun-filled workout. 6th class pupils were also quick to differentiate activities for younger pupils and our pupils with SEN when needed! Well done Rang a Sé – we can’t wait for next year already! Check out some pictures in the blogpost link below – we even made it onto television! Wake Up, Shake Up – Some classes engage in ‘Wake Up, Shake Up’ activities in their classrooms between morning lessons – some classes like to use the very popular website “GoNoodle” to engage pupils in different exercises which adhere to the curriculum strands. Other classes enjoy following ‘Just Dance’ videos; the class can listen to popular modern music and get grooving! Sponsored Walk and Annual Clean Up! Carrig NS also promotes getting the children moving with our yearly sponsored walk and annual clean up – we love to get walking for a good cause! We are so lucky to have a beautiful grounds full of nature surrounding our school. Many classes take this opportunity to bring out learning outdoors and get moving while doing so! We use maths trails and nature trails to integrate physical activity into some other curricular areas! See some examples below. Our school has an up to date PE policy which was formulated by the staff. We focus on 5 of the 6 strands each year. The 5 strands we currently focus on are Athletics, Aquatics, Dance, Games and Outdoor and Adventure Activities. PE in our school provides children with learning opportunities to develop physically as well as socially, emotionally and intellectually. Our school PE policy follows the principles outlined in the 1999 Primary Curriculum documents. Our policy for PE outlines our agreed approach to teaching PE and the content of the programme of the curriculum at each class level. Several members of staff are members of the Irish Primary PE Association (IPPEA). Each class is taught five different PE strands each year from Athletics, Aquatics, Dance, Gymnastics, Games, Outdoor and Adventure. Our school prioritises a different PE strand for further development each year. Teachers make use of the PSSI lesson plans to guide their delivery of the Primary PE Curriculum. Specialist coaching in tag rugby, Irish dancing, GAA and basketball is provided. Outdoor facilities such as the yard, basketball courts, astroturf, infant play area and playing field are also available. Every child’s progress in PE is discussed at parent/teacher meetings. Feedback about progress in PE is included in our annual school reports. Our school prescribes Physical Activity Homework during the school year. The school facilitates an Active School Week annually encompassing as many of the strands of the PE curriculum as possible. An annual Sports Day takes place in the last term of the year. A ‘Santa Run’ is scheduled to take place in December 2018. School tours that are activity based are promoted throughout the school. Our school has a detailed inventory of equipment which is checked and updated regularly. Our PE equipment and resources are well organised and accessible and our school strives to make maximum use of the PE equipment available to us. In 2018, Operation Transformation teamed up with Active School Flag to promote activity in primary schools. Our 6th class ran some fantastic 10 @ 10 sessions which got pupils and staff alike moving and grooving! You can check out our blog post all about it below – our claim to fame was a short clip of our children taking part being shown on the programme! Carrig teamed up with our local GAA club Kildangan to promote a love for hurling and gaelic football among younger pupils. This initiative was aimed at 2nd class and allowed the children who are not involved in the club to get involved in and develop a love for GAA sports as beginners. It also allows the children who play GAA sports regularly to work with their classmates and practise previously learned skills. It was the perfect way for 2nd class to get active, improve their hand/eye co-ordination and agility skills and learn from one another! A huge thank you to Brid Hackett who runs this session. We also have a great partnership with Nenagh Ormond Rugby Club; from midterm break until the Christmas holidays 3rd – 6th classes will partake in Tag Rugby with Paddy on Mondays. This is a great way to get moving, learn some new skills and have lots of fun! Of course a huge partnership we have to promote physical exercise amongst our pupils is with our parents and Parents Council. They have kindly fundraised so for our Walk and Talk track to get children moving at lunchtimes and also for our amazing astroturf which allows us to enjoy PE lessons weekly if the pitch gets a bit too wet! We also give a huge bualadh bos to our pupils and parents who park in the local Park and Stride, or who live close by, and walk to school during fine weather! Our staff has also joined up with North Tipperary Sports Partnership and will complete a training programme ‘Disability Awareness in Sport’ in the new year 2019. Our school established an Active School Flag Committee to begin our ASF process.The committee includes children from first to sixth class. Informing the staff and classes about initiatives discussed at AS meetings. Collecting suggestions from pupils in their classes and presenting these at AS meetings. Organised active flag slogan/ poster competitions. Researching local sports clubs and physical activity providers to provide taster sessions during the Active School Week. 2018 – A hugely successful Active Schools Week took place in June 2018 where the whole school was involved in different activities daily. It was a huge success and enjoyed by pupils and staff alike. The different activities which took place throughout the week can be seen in the following blogposts. We can’t wait for next years Active Schools Week!